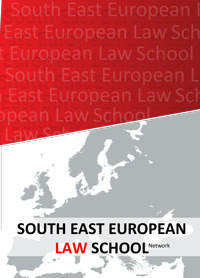 The South East European Law School Network (SEELS) is the first academic network of its kind that brings together 12 active distinct Law Schools from the region (11 regular and 1 associate member). SEELS is established with the aim of improving cooperation between the Law Faculties in the region and thus improving their scientific, teaching and administrative capacities. It is dedicated to increase international competitiveness and high level of performance in the field of legal education, research and publishing particularly with regard to curricula development, inter-institutional cooperation and integrated study programmes at a regional level, through a planned three-pillar-approach (education, research and publishing). In that sense, SEELS supports the strategic development of the Law Faculties and addresses the three identified target groups (student, academic staff and legal professions). Through the development and introduction of new joint programmes and activities in the area of education, further professional training, research and publishing in the field of law the SEELS members are able to offer attractive and specialized courses and programmes and thereby facilitate regional mobility of scientists, students, researchers and lawyers. SEELS’ region is one of the most diverse sub-regions on the European continent. As for the future of this region, there is no doubt that all the states within are strongly determined to join the European Union. Therefore, they share tasks, needs and challenges in the process of integration and approximation. One of their crucial tasks is the adoption of the acquis communautaire (the legislation of the EU bodies) and the harmonisation of their legal system with the one of the EU. Also, the rule of law also plays a crucial role, as one of the prerequisites of the Copenhagen Criteria. The aforementioned tasks can be dully fulfilled only with a strong legal education system, wherefore the SEELS was established in 2011. The establishing was supported by the Deutsche Gesellshaft für Internationale Zusammenarbeit (GIZ) Open Regional Fund for South East Europe – Legal Reform. Presently, twelve Law Faculties from Albania, Bosnia and Herzegovina, Croatia, Macedonia and Serbia are regular members of SEELS. 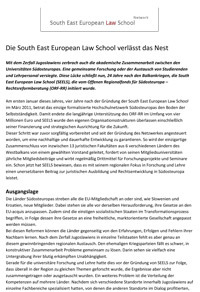 The Deutsche Gesellschaft für Internationale Zusammenarbeit (GIZ) Open Regional Fund for South East Europe – Legal Reform is an honorary member of the network.